ISRO's first mission to the red planet provides a fillip to its local component suppliers. The Indian Space Research Organisation (ISRO) wasn't the only one rejoicing after launching its first rocket toward Mars on November 5. Dozens of ISRO's local component suppliers also were cheering the successful start to the interplanetary mission. From Mumbai-based Godrej & Boyce to little-known Trichur firm Vajra Rubber Products, many companies are hoping the mission will not only boost their aerospace businesses but also provide a fillip to related businesses in the engineering, nuclear and defence sectors. "Many of our learnings from our technological involvement with these sort of projects get into our consumer products sooner or later," says Godrej group Chairman Adi Godrej. Godrej & Boyce fabricated a high-gain antenna reflector mold, among other components, for the Mars mission. The antenna will help the spacecraft transmit radio signals to Earth. S.M. Vaidya, Executive Vice President and head of the aerospace division at Godrej & Boyce, says the experience of working with ISRO has helped the company in other markets as well. The company earlier this year got an order, estimated at Rs 250 crore, for the Thirty Meter Telescope, the world's largest, being built in the US. 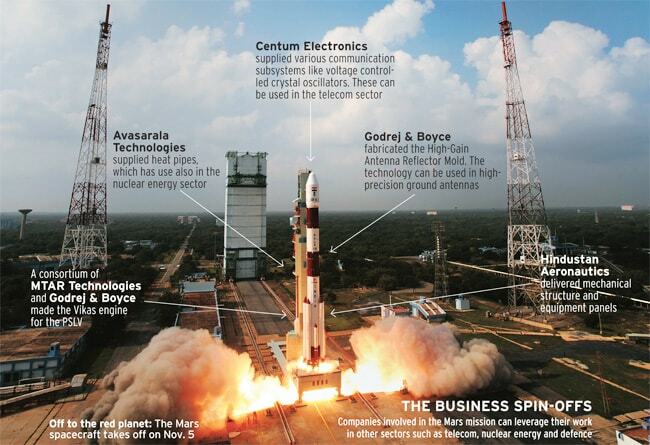 Another company involved with both ISRO's Mars mission and the telescope project is Avasarala Technologies. The Bangalore-based firm supplied heat transfer pipes for the Mars orbiter and some ground equipment, says CEO and Managing Director T.T. Mani. He says that, because the company has worked in these areas, it has improved its quality and systems. This has helped it get export orders in sectors like nuclear power and factory automation. "In the past three years the share of exports in our total revenue has risen to 35 per cent from five per cent," he says. The Mars mission aims to explore the planet's surface, look for methane gas, and develop technologies that will help in interplanetary travel. ISRO pegs the mission's cost at Rs 450 crore, far lower than similar projects by the US and Europe. 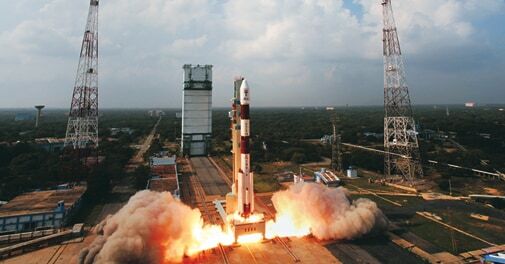 While the use of established technologies such as the Polar Satellite Launch Vehicle (PSLV), which carried the Mars obiter, helped ISRO control expenditure, the involvement of a large number of Indian companies - about 170 - is also an important reason for the mission's lower costs. These companies include the state-run aerospace giant Hindustan Aeronautics Ltd (HAL) on one hand and a small rubber products company such as Vajra Rubber on the other. HAL delivered riveted structural assemblies and welded propellant tanks for the PSLV. It also supplied the bare satellite structure and deck panel to ISRO. Vajra supplied flex seal, a component which helps in direction control for rockets. Bangalore-based Centum Electronics, MTAR Technologies of Hyderabad and Pune's Walchandnagar Industries are also among the companies involved in the Mars mission. MTAR, a precision engineering firm, supplies the Vikas engine for the PSLV in a consortium with Godrej & Boyce. Centum provided various communication subsystems for the Mars spacecraft. In its 2012/13 annual report, Centum says it will continue to co-develop products with ISRO and the Defence Research and Development Organisation to grow its strategic electronics business. Walchandnagar, a Rs 1,000 crore company, mainly supplies components for satellite launch vehicles. G.K. Pillai, Managing Director and CEO, says working with ISRO has helped Walchandnagar enter related businesses. "In the past five to seven years we have been able to get involved in the Indian defence sector, including for rocket launchers used by submarines," he says. Space projects also raise the global profile of the suppliers and help them bag export orders. Take, for instance, Coimbatore-based Lakshmi Technology and Engineering Industries. Revenue at the maker of precision engineering parts for the aerospace and defence sectors has jumped to Rs 15 crore from Rs 5.5 crore three years ago, thanks mainly to growing exports. So, where do suppliers go from here? 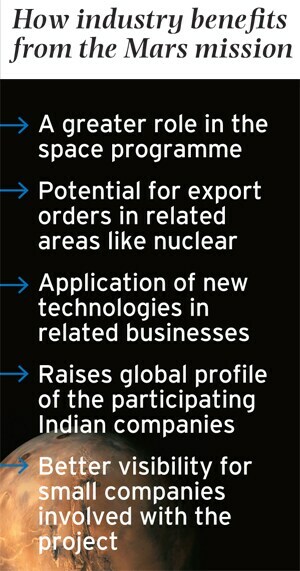 What will be their role in India's future space missions? Kiran Karnik, a former president of the software industry body Nasscom and who worked at ISRO for two decades, feels high-precision areas like space have multiple business spin-offs. Direct-to-home broadcasting, for example, will require high-precision ground antennas as we go up the frequency band. 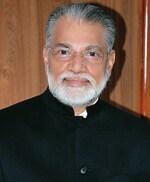 ISRO Chairman K. Radhakrishnan wants the suppliers to move up the value chain. "More than 400 Indian companies work with us at the component, material and fabrication levels," he says. "We want a higher level of integration with them to make PSLVs and satellites."